Charles Scribner's Sons moved into their twelve-story Fifth Avenue headquarters in May of 1913, with a three-level bookstore facing the street. The building was designed by Ernest Flagg, Chas. Scribner II's brother-in-law, who was also the architect responsible for the (then) recently completed Singer Building. This was a beautiful space, with balconies running along both sides of the main floor with a grand staircase in the rear. Three stories of glass frontage brought light in from the street. 597 5 Avenue was landmarked on March 23, 1982. The eighties were a turbulent time for Scribner's; the company merged with Macmillan in May of 1984 and the Scribner family sold the Fifth Avenue building in September of the same year. 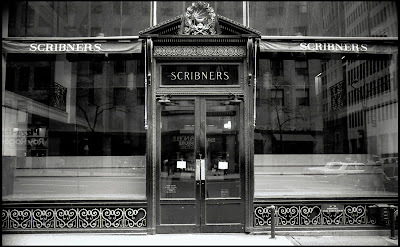 In December Rizzoli International bought the Scribners' Book Stores. 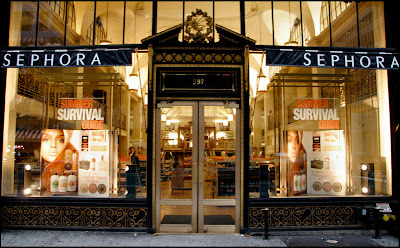 The space later was the main Manhattan location for the Benetton company, and currently holds a Sephora skin care store. The doors have been replaced with brass fixtures, these also have a glass section where the originals had an opaque kickplate. The gilding has been kept up very well; the Scribner's logo above the door is like the shiny spot on the tip of a woman's nose. Which makes this the perfect location for finding the cosmetics to take care of something like that, no? of my refdesk PC's background. get sent back here. Huh. now I see that little line. ooh, a "Next Update On:" feature! way to put pressure on yourself.